Former Anambra State governor, Dr. Chukwuemeka Ezeife, has debunked the claims by former Kaduna State governor, Alhaji Lawal Kaita that the North has not benefitted more than any other region in the country. Speaking with VINCENT KALU, the former Anambra governor warned that the North will be the greatest loser if Nigeria disintegrates. Former governor of Kaduna State, Alhaji Lawal Kaita, in an interview with Saturday Sun stated that the Igbo are not marginalised,. According to him, they are crying wolf where none existed. He went further to ask the ways the Igbo are being marginalized, when they are doing better in some states than even their hosts. Do you agree with his submission? I appreciate his acceptance that Igbo sometimes do better than their hosts. He must accept also that the Igbo take keen interest in developing where they are, and this comes from the Igbo adage that where a person lives, he mends. Therefore,we have taken development to the remotest part of Nigeria. While we are making progress, we do not hide what we are doing, therefore anybody could copy what we are doing to make progress. God didn’t marginalise the Igbo, but all of us own the government. President Muhammadu Buhari, when he started to make appointments, appointed more than 40 persons without one of them coming from the Southeast. Some people from the zone who occupied offices, as soon as Buhari came to power, they were dropped. This was done at NIMASA, where an Igbo was appointed, but he was removed. Today, when the National Security Council is meeting, there is no Southeastern person among them. The government of Buhari removed so many southern Christian officers in the army and all security agencies. The Southeast persons dominate the list of persons removed from office by the Federal Government; the same Southeast person has no representative in the list of appointment. Nigeria has six geo-political zones and six major political offices, namely: president, vice president, senate president, speaker of House of Representatives, chief justice and secretary to the government. The least of them is the secretary to the government, but not even that was given to the Southeast. Major body language of the president shows hatred for the Igbo. The army massacred young men who were not carrying even sticks in Aba; they massacred other young men who were carrying Bible in remembrance of their members; they also massacred other young men who were jubilating in Port Harcourt that Donald Trump won the American election. Python Dance by the army has not been held in Kaduna, Katsina, Kano, Northwest or Northeast, but not only are they occupying Southeast militarily, so many people have been killed, and more people have been used as tools for humiliation and dehumanization. You saw the videos, where some people were forced to drink mud water; others forced to swim in muddy water, and other forms of humiliation. There are so many indications of hatred and marginalisation Are you talking about infrastructure in the zone? The federal roads are not passable; the money spent by state governments on federal roads is not refunded them so that they would not have money to fix federal roads. In spite of all these, most Southeast people want one Nigeria, and they are not clamourig for seccession. The youths who cannot bear it any longer are the people who are protesting. I remember from the first month of Buhari’s reign, I kept saying that the president was pushing Igbo out of Nigeria, and stoking the fire of IPOB and MASSOB. Alhaji Kaita also said that the North has not benefitted more than any other region, do you agree with him? He may not be familiar with history. What reason did Lugard and his people have in amalgamating the North and the South? The reason was that the South was having surplus and the North was having deficit. The British made up the deficit and then they became clever and said why not merge them so that we use the surplus from South to make up the deficit from the North instead of dipping our hands in our treasury to make up the deficit in the North. There is a fundamental problem, which is even affecting the issue of restructuring. The North that has more than 80 percent of the oil wells in Nigeria created more states to themselves. Out of the 36 states, they have 19, and out of the 774 local governments, they gave themselves about 409. Sokoto used to have the same number of local governments as Lagos, 20 each. Today, out of the same Sokoto we have 83 local governments, while Lagos is still with 20. Kano has 44 local governments, Bayelsa has eight. All of them are paid from federal resources. Control of political power is also in the North. Out of the federal leadership, the North has produced more and has also produced military rulers who ruled and ruined Nigeria, and we are talking about how to repair it and some people are talking nonsense, and they are refusing to see reason, and refusing to know that they are the greatest loser in a disintegrated Nigeria. What is your take on Kaita’s claim that the Igbo caused the major challenges that Nigeria has faced since independence? How did the war start? Was it not that the North that said the basis of unity or one Nigeria is not there and the British told them, are you foolish, when we have packaged and put you on top of everybody. The story changed, ‘to keep Nigeria one is a job that must be done. The same people who said there was no basis for Nigeria’s unity, now turned out to say that to keep Nigeria one is a task that must be done. To keep Nigeria one was the reason for the war. Otherwise, unless somebody is talking without thinking. After the pogrom in the North, our people said we have had enough, whatever that is good keep them; we want to leave Nigeria and create a world of our own. The government of Nigeria said no, they were going to finish Biafra. That was after some good people invited Nigerians to Ghana, and at Aburi, an agreement was reached on how to survive and grow as Nigeria. If that agreement were adopted by now, we would have been competing with most advanced countries of the world. No country is gifted like Nigeria. The climate is so fantastic, and any plant that can grow anywhere in the world can grow in Nigeria. Animals, we have them; minerals, we have them in surplus. Ohanaeze says the Igbo don’t want session, but want restructuring. Are you in line with that position? We have a statement in Igbo, ‘life without honour is not worth living’. That’s why Igbo slaves more than any other slaves in the world before, committed suicide and some jumped into the ocean. Biafra may become inevitable, when it comes to a stage that we live a life without honour in Nigeria. What is going on under Buhari is life without honour for the Southeast people. But southeast people have the foresight of knowing the condition they found themselves. Based on Buhari’s marginalisation, it may be possible for Nigerians to rethink. Presently, in Lagos, they held a meeting where the Yoruba and Igbo declared themselves as one, and then South-south joined, and hopefully, the Middle Belt will join them. Anybody who cannot think and say let Nigeria break up, even long before now, remember the coup makers, had excised the core North from Nigeria. We will live in Nigeria if it is restructured and organised, with justice and equity. That is what every Nigerian group wants. We have large population, large economy, the market is there. You can’t be a super power in the world without being a large population. You see Switzerland and all those other small countries, they are very rich, but they cannot be super powers. 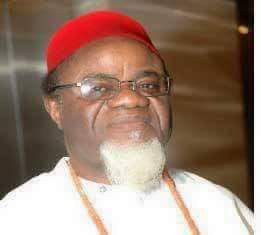 I’m in line with the Igbo position of restructuring, with justice and equity prevailing than to rush into small space called Biafra. Members of Boko Haram are secretly tried, while IPOB members and others are openly tried. Does it mean that we have two separate laws for different people in Nigeria? The northern politicians created Boko Haram and used it to get the presidential powers back. Boko Haram is rejection of western education and democracy. Is it surprising that most of the people who financed Boko Haram are the leaders of the North, and they are feudalists. Go to Yoruba land, the father wants the son to be greater than him; go to all South, the father wants the son to be bigger than him. In the North, the rich doesn’t want anybody to challenge them, they want them to remain the masses, poor, indigent and uneducated. Let them continue to do whatever they like with Boko Haram. It is obvious that you have a sect with equipment fighting and you leave them and come to stage operation Python Dance in an area where the IPOB members don’t even carry sticks. You can see the favourable treatment given to the armed Boko Haram, while the other unarmed IPOB members were made to drink muddy water and also swim in muddy water. That shows that there are separate laws for separate people in Nigeria. There was a storm over free medical treatment carried out by the military in Anambra, why? Last week, I was in Anambra, a traditional ruler called me and told me that his people were called to come out on Wednesday for free medical treatment by the military. He asked me whether he should allow his people to come out for the exercise. I told him, no, that if we could not stop them from killing with guns, we shouldn’t allow them to kill us with syringe. But on Wednesday, they went to schools in Anambra for the free medial treatment and everybody including school children were running helter-skelter, and parents were running to take back their children in the schools. I appeal to every parent in the Southeast to not allow their children to be treated by the soldiers. We are rich enough to treat our children. We are grateful to the governor of Anambra State for approaching the military and advising them to stop the medical treatment of our people until we understand what they want to do. The military should have gone to the minister of Education or the commissioner of Education or commissioner of Health, and the governor before releasing the soldiers in a civilian population. Whether it was an intended good or evil, they approached it in a very wrong way.